What is the best english wheel you can buy in 2018? That’s what we will look in to today. We’ve pulled together 5 top rated wheels to bring you a comprehensive comparison and review of each. For our findings at a glance, just head to the table below. For a dedicated buyer’s guide plus a full in depth review on each of the english wheel, keep on reading. 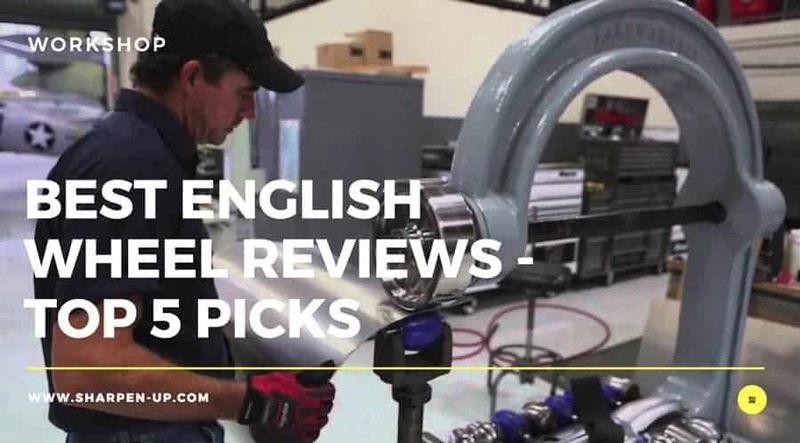 There are of course a wide range of models, brands, and styles of English wheels, (our buyer’s guide after the review section will dig deeper into this). Theses can be rated based on their work efficiency, cost-performance, design, durability, and ease of use. Using this criteria and a whole lot more we have reviewed the following 5 english wheels. The Grizzly T25101 gets our top pick choice because it perfectly balances affordability with an excellent degree of functionality. 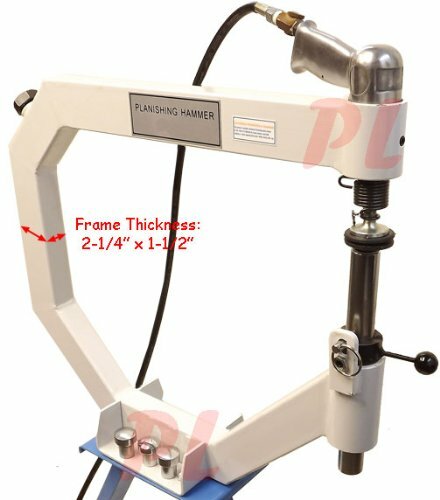 It is a compact, manually-operated bench-top model that is capable of forming smooth double curvatures on sheet metals. 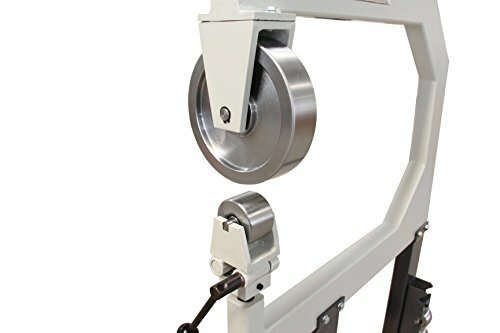 For those on a budget looking for an english wheel for the home workshop, this really is a great choice. The Grizzly is designated as a small English Wheel due to its small size and lightweight nature, yet it can handle delicate metal shaping. It has all the core components of a Standard English wheel. This China-made model is designed and developed by Grizzly Industrial, Inc. The fully set-up unit is 21inches long, 25inches tall, and 2inches thick. Its C-shaped frame is made of powder-coated gusseted steel tubing. The powder-frame is corrosion resistant, and this not only prevents rust, but also ensures that the frame is durable as its structural integrity is preserved for a long time. As you can see from the images the color scheme of this frame is in the traditional Grizzly teal-green. The rolling and anvil wheels are made from hardened steel, which makes them wear-resistant – a useful quality for a component that works by spinning around, while subjecting pressure on a metal sheet so as to shape into into a contoured sheet. This model comes with 7 anvil wheels, which are placed on a storage rack that is fitted atop the top arm of the C-shaped frame. These anvil wheels include one with a flat contour, and the rest have a contour radius of half an inch, 1 inch, 1-1/2inches, 2-1/2inches, 5inches, and 9inches. The rolling wheel has a flat contour and its diameter is 5-7/8inches (15 cm). This wheel permanently fixed in its wheel housing. 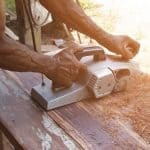 On the other hand, the die-holder of the anvil wheel is secured to its threaded post, and its wheel bracket allows for anvil wheels to be placed on it and locked for use, and thereafter be easily detached from the die-holder. Even so, the workpiece clearance, which is determined by the throat capacity, is relatively small. Its throat capacity is 15-3/8inches (40cm). 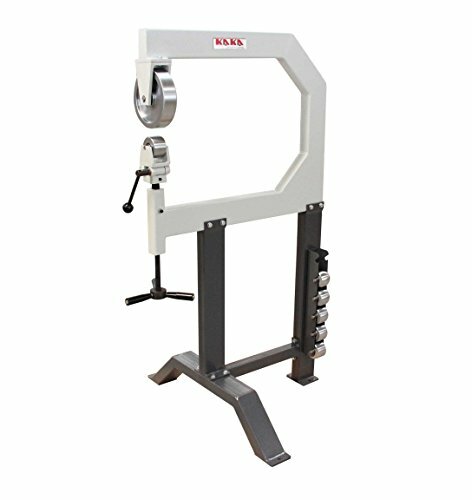 Even though this throat size is on the lower range of throat capacities, it is suitable for this hand-operated model because it limits the user to carrying metal plates whose width is up-to 50 centimeters, which is fitting for a person shaping metal sheets while constantly holding them. A larger width would tire the user by straining the arm muscles and requiring the sheet metal to be passed through the anvil and rolling wheels at a slow speed so as to prevent tripping. The Grizzly T25101 can handle a 16-gauge metal sheet made from copper, aluminum, and mild steel. This bench-mounted English wheel prides itself of having a short assembly time of about 10minutes. The lower arm of its C-shaped frame lacks any brackets that can be used to bolt it to the bench. 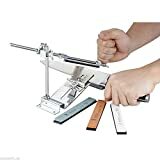 Still, this offers the advantage of allowing the user to easily clamp this lower arm on a vice grip, and then fix the appropriate anvil wheel before commencing work. It also comes with a quick-release lever that is fitted directly beneath the anvil die-holder. 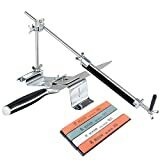 Furthermore, it is easy to install and use this English wheel, and a beginner metal crafts-person as well as an amateur metal-shaping hobbyist can seamlessly use this model to form superb metal shapes that features intricate double curvatures. To top it all off, the Grizzly T25101 is supported by a 12-month warranty provided by Grizzly Industrial, Inc.
Comes with 7 different anvil wheels. Has a gusseted powder-coated, corrosion-resistant steel-tube frame. Wheels made from wear-resistant hardened steel. Can handle up-to 16-gauge metal plates. Post of anvil die-holder plays a lot in its housing in the lower jaw of the C-shaped frame. Throat depth limits width of workpiece to about 40cm. Improper use can lead to over-stretching and thinning of metal sheet when a high-crown anvil wheel is used. The Grizzly T25101 is a small, compact, and lightweight manually-operated bench-top English wheel with a throat capacity of 15-3/8inches. However, despite the small size it still has a lot of functionality for the money, and is capable of forming smooth double curvatures on 16-gauge sheet metals. Another big selling point is the fact the unit gives the user the option of easily using any one of its 7 differently-sized anvil wheels. Its excellent cost-performance ratio, simple and compact design, durable nature, and ease of use makes the Grizzly T25101 the best english wheel in our top 5 review round up. This offering from Central Machinery is a well-built, easy-to-use manually-operated free-standing English wheel. The manufacturers have opted for a simple design that features 4-inch welded all-steel frame construction that can handle metal forming of 16-gauge steel plates and 14-inch copper or aluminum plates. It has all the main parts of a Standard English wheel. This floor model is designed and developed by the California-based company, Central Machinery. This floor-mounted English wheel model has an overall height of 5feet. Its C-shaped frame is a 4-inch welded all-steel frame construction that is coated by a corrosion-resistant material. This frame is strong and durable as it can maintain its structural integrity for a long period. 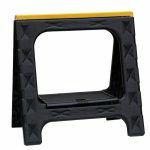 Its floor stand features a bi-forked front footing and a rear post footing. The base of these mounts have round holes that can be used to bolt in caster wheels, hence making this English wheel to be mobile (easily wheeled around) in the the workplace. The rolling and anvil wheels are made from hardened materials, which makes them wear-resistant. This model comes with a storage rack that can take in 6 anvil wheels. This storage rack that is fitted on the rear vertical foot of the floor mount. However, it is shipped with only one anvil wheel installed in the anvil die-holder. 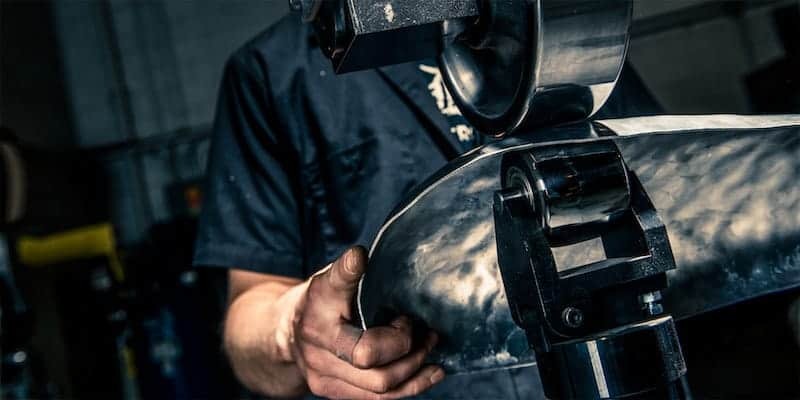 The user is expected to separately purchase the other 5 anvil wheels; and this ultimately increases the cost of the equipment as one must purchase 5 other anvil wheels so as to be able to choose the most appropriate anvil wheel for each specific job. The rolling wheel has a flat contour and its diameter is 8inches, while its width is 2inches. This wheel permanently fixed in its wheel housing. On the other hand, the die-holder of the anvil wheel is secured to its threaded post, and its wheel bracket allows for anvil wheels to be placed on it and locked for use. The anvil wheel that is shipped with this model is 2inches wide and has a diameter of 3inches. Still, its workpiece clearance is determined by the throat capacity. Its throat capacity is 27-3/4inches which is relatively large for a hand-operated model. This allows the user to easily shape large metal sheets, so long as they are not heavy as this would tire the user by straining the arm muscles as well as risking the user as one can trip when feeding the metal sheet through the rolling and anvil wheels. The Central Machinery B0074JTRA4 can handle a 16-gauge steel sheet, and a 14-gauge metal sheet made from copper or aluminum. The assembly time of this model is short. It also comes with a quick-release lever that is fitted directly beneath the anvil die-holder. 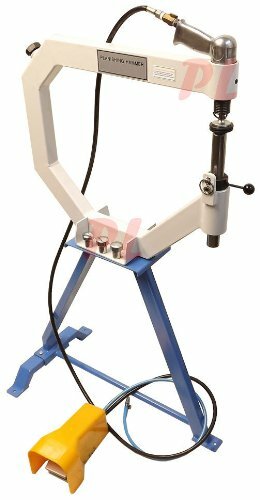 It is easy to install and operate this English wheel, and both beginner metal crafts-person and amateur metal-shaping hobbyist can easily use this model to create superb curves on sheet metals. Can be wheeled around if caster wheels are fitted. Has a 4-inch welded, all-steel frame construction. Wheels made from wear-resistant hardened metal. 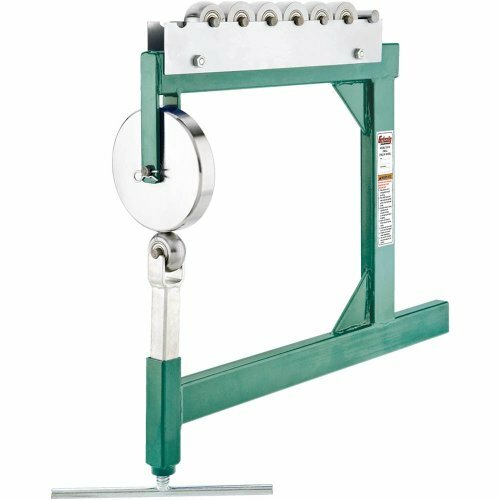 Can handle up-to 16-gauge steel plates and 14-inch aluminum or copper plates. Comes with only 1 anvil wheel even though its storage rack can store up-to 6 anvil wheels. Expensive when compared to the Grizzly T25101. The Central Machinery B0074JTRA4 is a well-designed, easy-to-operate manually-operated free-standing English wheel whose simple design features 4-inch welded all-steel frame construction. 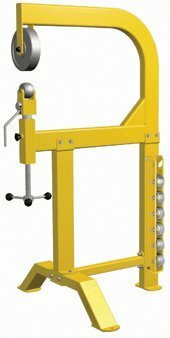 It has a 27-3/4inches throat capacity which along with hardened wheels allows it to handle metal forming of 16-gauge steel plates and 14-inch copper or aluminum plates. 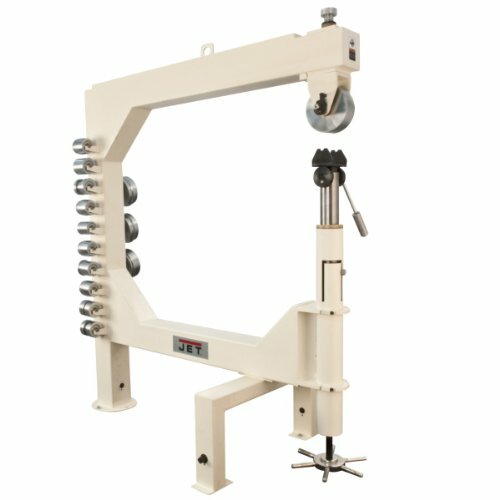 This is a special type of pneumatically-operated, free-standing English wheel that operates as a planishing hammer for smoothing out dents in metal sheets. Unlike the standard English wheel, this model is capable of forming smooth a curve on a metal sheet; and it does so be replacing the rolling wheel with a flat-shaped hammer-like head, while the anvil wheel is replaced by a series of flat metal cylinders that can be interchanged when necessary. Instead of a rolling wheel die-holder, there is a spring that surrounds the a movable rod. This rod moves up and down, and it goes through the upper jaw of the C-shaped framed where its top end is connected to a piston that is operated by pressurized air. 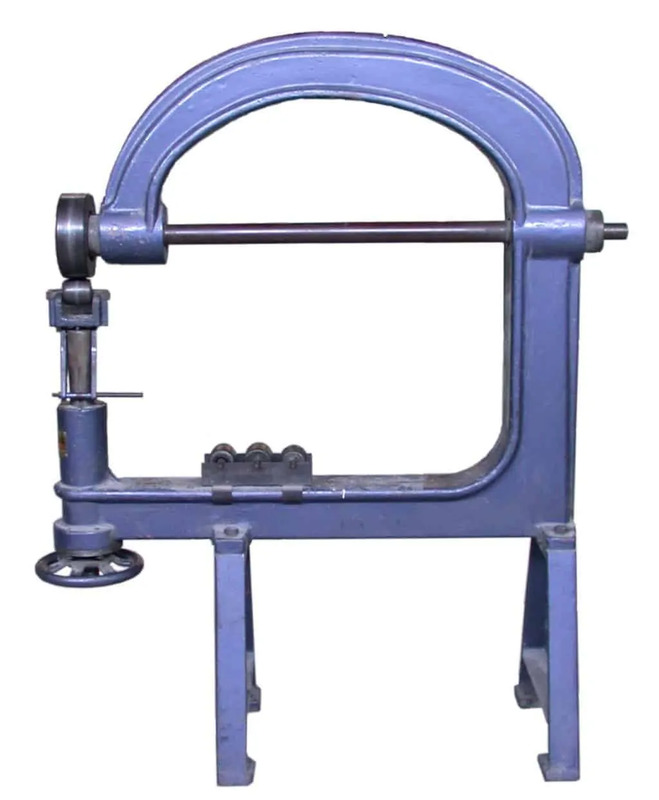 Pressurized air pushes the piston downwards against resistance offered by the spring which is forced to stretch as the rod rapidly pushes the attached hammer-like head to strike the flat surface of the anvil cylinder. Afterwards, when air pressure is low in the piston chamber, the spring contracts back to its original state, and this pushes the rod and hammer up. 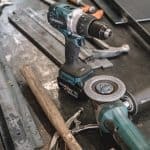 Therefore, the pressurized air and spring action is used to create oscillating motions of the hammer-head which allows this model to operate as a rapid beating plashing hammer. The top of the anvil cylinder is domed which allows this model to form smoothly-contoured or curved metal sheets. This compact, low-weight model can handle delicate metal shaping, and with the exception of the anvil and rolling wheels, it still has all the core components of a Standard English wheel. The entire unit is 29inches long, 16inches wide, and 48inches tall. Its C-shaped frame is made of powder-coated steel construction. The color scheme of this frame is silver. There is an air hose that routes pressurized air from the air pump to the planishing hammer. The air pump is located at the base of the floor mounting, while the air hose connects to the piston housing that protrudes atop the upper jaw of the C-shaped frame. 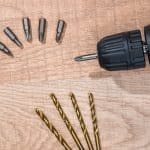 The air pump operates at a speed range of between 875 and 1350rpm (revolutions-per-minute), and this is also the speed at which the hammer strikes the metal sheet as it is being planished out. The air inlet is a 1/4inch 18NPT female that is easily threaded into the internal threads of the piston housing. The minimum operating air pressure is 50 pounds-per-square-inch(psi) while the maximum value is 100psi, and this is pumped by high-quality air compressor whose rating is 4 cubic-foot-per-minute(cfm). Its throat capacity is 19inches which is quite appropriate for an English wheel that does metal planishing as it allows large metal sheets to be rapidly flattened and made dent-free. This makes this model useful in vehicle restoration. It supports 3 cylindrical anvils of the following diameters; 1-inch, 2-inch, and 3-inch. There is a quick-release lever underneath the anvil bracket that allows the user to increase the gap between the planishing hammer and the anvil cylinder to a maximum of 4inches. The anvil height adjustment allows the user to set the anvil height at either of 2 positions; the 2-positions level where a lock pin ensures that the anvil shaft mount allows the anvil-to-head opening to be between 3/8inches and 1-1/4inches. Then there is the 4-positions level where a stepped micro-adjustment block is used to increase the anvil-to-head opening by 1/16inches for each level. Has a durable steel frame. Works poorly with thick sheet metals. Improper use can lead to over-stretching and thinning of metal sheet. The Air Pneumatic is a special type of pneumatically-operated, free-standing English wheel that operates as an auto-body planishing hammer for forming smoothly-contoured or curved metal sheets, and it supports anvils whose radii is 1-inch, 2-inch, and 3-inch. The Jet 756151 is a well-designed, manually-operated free-standing English wheel model that can form smooth compound curves on metal sheets. Featuring a heavy-duty frame both the rolling wheel and anvil wheel can be swiveled by 90 degrees. This enables it to handle delicate shaping of large metal sheets. It has all the core components of a Standard English wheel. This high-quality model is designed and developed by Jet Tools. This sturdily-constructed floor-mounting model weigh about 458pounds. The fully set-up unit is 58inches long, 64inches tall, and 31inches wide. Its C-shaped frame is made of square coated steel tubing, with the tube being 4inches thick. The coating improves the corrosion resistance of the steel frame hence making it durable by maintaining its structural integrity. The rolling and anvil wheels are made from hardened metal, which makes them wear-resistant. This model comes with 10 anvil wheels, which are placed on a series of storage brackets that is fitted along the vertical arm of the C-shaped frame. These anvil wheels include one with a flat contour, and the rest have a contoured radius. The rolling wheel has a flat contour and its diameter is 6inches. This wheel can be detached from its wheel housing, and interchanged with another more suitable rolling wheel. This model comes with 4 rolling wheels, with one fitted to the rolling wheel die-holder, while the other 3 are placed on a series of storage brackets that is fitted along the vertical arm of the C-shaped frame. The rolling and anvil wheels have a sealed bearing system which ensures that they operate smoothly. The workpiece clearance of the Jet 756151 is determined by its throat capacity, which is 45inches. This large throat capacity is fitting for a hand-operated model that allows both the anvil and rollings wheels to be swiveled around by 90 degrees. Therefore, this model does not limit the width of the metal workpiece it can work upon. The limiting factor would then be the ability of the user to carry the workpiece into the equipment, and then hold it safely while it is being shaped. The Jet 756151 also comes with 3 sets of fender groove-shaping wheels, and these alongside the machine-supplied rolling and anvil wheels allow this model to roll beads. It can also handle 16-gauge mild-steel metal plates as well as copper and aluminum metal sheets that are 1/8inches thick. This model has a short assembly time, and it comes with a quick-release lever that is fitted directly beneath the anvil die-holder. Equally, it is easy to install and use this English wheel, and a beginner metal crafts-person as well as an amateur metal-shaping hobbyist can easily use this model to form superb metal shapes that features intricate compound curves. The Jet 756151 is supported by a 24-month warranty provided by Jet Tools. Allows rolling and anvil wheels to swivel independently by up-to 90 degrees. Comes with 10 different anvil wheels. Comes with 4 different rolling wheels. Has a corrosion-resistant steel-tube frame. Can handle up-to 16-gauge mild-steel plates and 1/8inch thick aluminum or copper plates. The Jet 756151 is a large, manually-operated free-standing English wheel model that can form smooth compound curves on metal sheets. It features a heavy-duty frame that allows both the rolling wheel and anvil wheel to be swiveled by 90 degrees. It comes with 10 anvil wheels, 4 rolling wheels, and 3 sets of fender groove-shaping wheels. The Kaka is a high-quality, manually-operated free-standing English wheel whose simple design features an all-steel frame construction. This system can handle metal forming of 16-gauge mild-steel plates and 14-inch copper or aluminum plates. It has all the main parts of a Standard English wheel. This floor model is designed and developed by the Georgia-based company, Kaka Industrial LLC. This floor-mounted English wheel model weighs about 180pounds, and is 35inches tall, 31.5inches long, and 10.6inches wide. Its C-shaped frame is an all-steel frame construction that is coated by a corrosion-resistant material. This frame is strong and durable as it can maintain its structural integrity for a long period. Its floor stand features a bi-forked front footing and a rear post footing. Along the vertical rear foot is a storage rack that can hold 6 anvil wheels. The rolling and anvil wheels are made from hardened materials, which makes them wear-resistant. This model comes with 6 anvil wheels of the following contour radii: 2inches, 3inches, 4inches, 6inches, 8inches and 12inches. Therefore, unlike the Grizzly T25101 which comes with a flat anvil wheel for planishing, the Kaka F1.2X710 requires the owner to separately purchase a flat anvil wheel and this ultimately increases the cost of the equipment. The rolling wheel has a flat contour and it is permanently fixed in its wheel housing. On the other hand, the die-holder of the anvil wheel is secured to its threaded post, and its wheel bracket allows for anvil wheels to be placed on it and locked for use. The workpiece clearance is determined by the throat capacity, which is 28inches. This throat capacity is relatively large for a hand-operated model, and the user benefits because large metal sheets can be easily formed so long as they are not heavy as this would tire the user by straining the arm muscles as well as creating a risk of tripping. The Kaka F1.2X710 can handle a 16-gauge mild-steel sheet, and a 14-gauge metal sheet made from either copper or aluminum. The assembly time of this model is short, and it comes with a quick-release lever that is fitted directly beneath the anvil die-holder. The Kaka F1.2X710 is supported by a 12-month warranty provided by Kaka Industrial LLC. Comes with 6 anvil wheels of different contours. Has an all-steel frame construction. 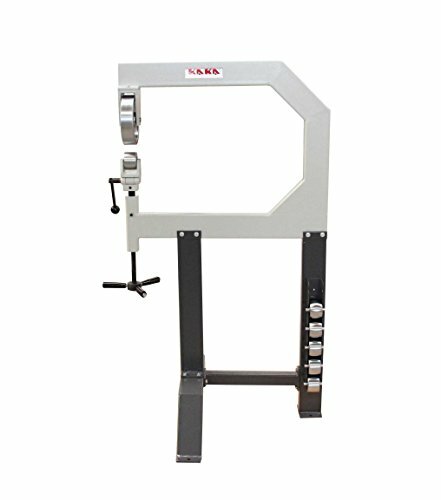 The Kaka F1.2X710 is a high-quality, well-built, and easy-to-use manually-operated free-standing English wheel. Featuring an all-steel frame construction with a 28-inch throat capacity that can handle metal forming of 16-gauge mild-steel plates and 14-inch copper or aluminum plates. What is an English Wheel? An english wheel is a sturdy, easy-to-use metalworking tool with a simple design that has very few moving parts and features a closed C-shaped frame. 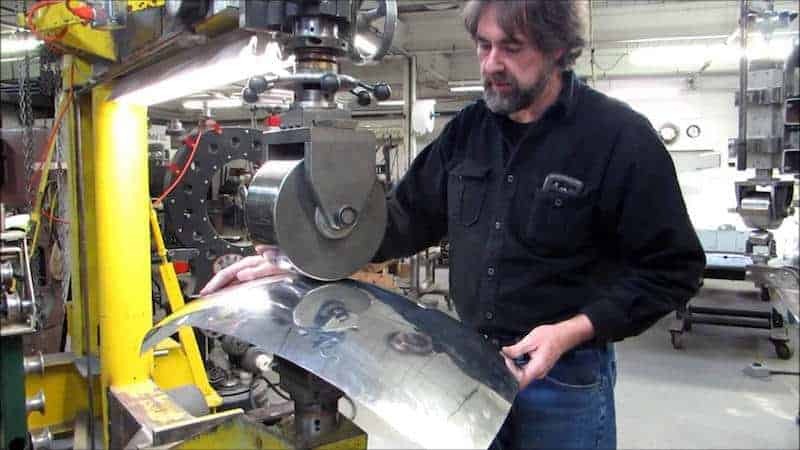 It is used to create compound curves, also called double curvatures, on sheet metals, and this allows these metal sheets to be shaped a desired. A crafts-person must guide the sheet metal through the English wheel so as to craft a customized curvature. This allows the user to create different curved (or contoured) metal designs using the same English wheel through a forming process called wheeling. This forming process uses surface stretching to thin the sheet metal where it is to be curved. 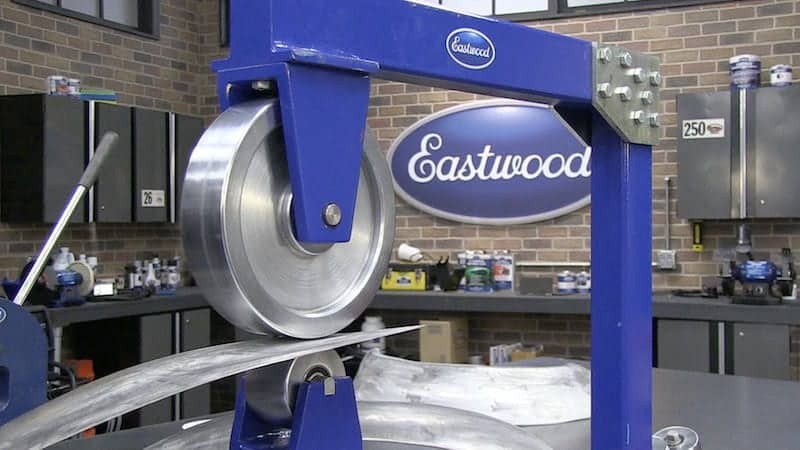 For this reason, it is recommended that the sheet metal being fed into the English wheel must be slightly thicker than the desired curved metal. Generally, it is used in low-volume work such as space frame chassis construction, car restoration, and coach-building. Usually, it works best with steel and aluminum sheets as compared to other metal materials. The most unique feature of an English wheel is its construction, especially its frame, which plays a key role in its operation. The frame is shaped like a large letter C, with the open jaws of the C-shaped frame being closed by a pair of dies (wheels) that have been secured to their respective wheel frames that are fitted into the open jaws. The wheel frame is also called a wheel housing, a die-holder, or a wheel bracket. The wheel secured on the top jaw is called a rolling wheel, and colloquially referenced to as the upper wheel; and its wheel housing is usually bolted through the top (upper) jaw of the C-shaped frame. On the other hand, the wheel secured to the lower jaw, the lower wheel, is specially designated as the anvil wheel. 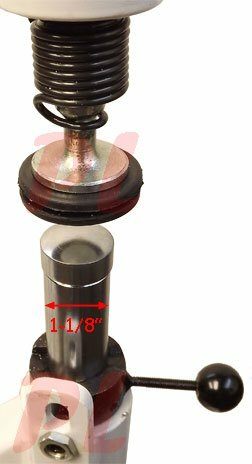 This anvil wheel can be moved up and down because its die-holder is fitted on a height-adjustable post that has a jack screw, which allows it to be screwed up or down using an adjustable wheel that is fitted at the bottom of the jack screw. Because the rolling wheel is bolted through the upper jaw, it cannot be moved up nor down, and is totally immobile in terms of height. Therefore, the key moving part of an English wheel is its anvil wheel which is used to adjust the gap between itself and the rolling wheel. This allows the workpiece to be fed into the tool, and be shaped and thinned according to set height of the gap. The rolling wheel is always larger than the anvil wheel; with most rolling wheels having a diameter of 9inches (25cm), while most anvil wheels have a much smaller diameter. However, the width of the rolling wheel – which is usually 3inches (8cm) – is not necessarily larger than that of the anvil wheel. In terms of cross-section, the rolling wheel has a flat cross-section (flat width), while the anvil wheel has a domed cross-section (that is, it is domed width-wise). This dome determines the size and depth of the upward arch that the anvil wheel produces in the workpiece. The rolling wheel is usually permanently fixed in its wheel housing, but the anvil wheel can be removed from its die-holder. Normally, most English wheel models come with a set of anvil wheels (3 or more) of different sizes (in terms of width, diameter and dome sizes); and this allows the worker to choose the most appropriate anvil wheel for shaping a workpiece. The size of the crown of the dome in the anvil wheel ranges from a deep arch to a shallow arch to an almost flat cross-section that is used for finishing a planished workpiece. The C-shaped frame is set to stand vertically on its mount, and the depth of this frame is described as the throat. Depending on the frame size, the throat can range anywhere between 14inches (35.6centimeters) and 48inches (120centimeters). This throat size determines the maximum width of the workpiece that can be worked on. This makes the throat a size-limiting factor when selecting work-pieces to be shaped. However, in some models of English wheels, the wheel housings of both the rolling and anvil wheels can be rotated up-to 90degrees along the vertical axis of their respective jaws, and this allows the worker to feed a work-piece of a much larger width than the throat size. The English wheel works by using the rolling and anvil wheel to generate large amounts of direct pressure on the metal sheet, and this causes the workpiece to be thinned out as it is shaped by the domed anvil wheel. However, if the gap between the rolling wheel and anvil wheel remains the same, then the amount of pressure that the workpiece is subjected to decreases proportionally as the material thins. For this reason, directly underneath the die-holder of the anvil wheel, there is a lever mechanism that is operated by a quick-release lever-handle that quickly and easily adjusts the anvil-to-rolling wheel gap so as to increase the pressure on the workpiece or to decrease the pressure so as to remove the workpiece from the English wheel. 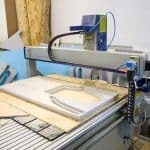 The bench-top models needs to be fixed on work-desks so that they can be used, and for most, the lower arm of their C-shaped frames is braced by a series of brackets that can be bolted or screwed into workbenches. On the other hand, the free-standing models, also called floor models, have their own stands and all that is needed is just to place them on flat surfaces and work can commence. Usually, the English wheel is manually-operated, but those used for crafting thick metal sheets can be electrically-powered, pneumatically-powered, or powered by a hydraulic mechanism.